Are you tired of staring at stained, dingy carpets? Don't spend the load of money it costs to replace wall to wall carpeting, simply call Los Angeles Carpet Cleaners! Our professional carpet cleaning service will have your carpets looking years younger in no time! Replacing carpet is a very expensive renovation for a home, requiring lots of work, including moving furniture. 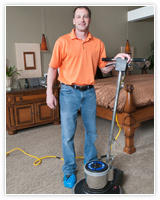 Carpet cleaning, on the other hand, can restore the sparkle to your carpets with just a fraction of the cost and labor. Carpet Cleaning Los Angels has a number of carpet cleaning methods depending on the type of carpet and area rugs you have. We perform services for both homes and offices, and are happy to meet your needs, whether you just want a small area rug cleaned in your home or an office full of wall to wall carpeting. Different carpets have different needs. 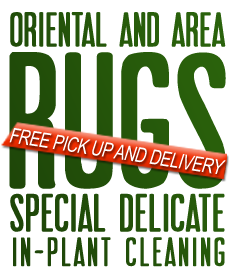 Some area rugs, such as antique and oriental rugs, may not tolerate any form of liquid used. There are special procedures to clean these carpets, requiring self-neutralizing agents that will not harm the fibers of your rugs. Standard wall to wall carpeting, on the other hand, can typically tolerate a small amount of liquid (cleaners always must be careful not to over-wet carpeting, as it can lead to staining and odors). For carpeting that can tolerate liquid, cleaning options include bonnet/pad cleaning, steam cleaning, and shampooing. Los Angeles Carpet Cleaners Bonnet/pad cleaning service involves a machine that looks like a floor buffer, with a circular pad that rotates along the surface of the carpet, removing dirt. A detergent is either sprayed onto the carpet or is soaked into the circular cleaning pad. In steam cleaning, also known as hot water extraction, hot water is finely sprayed into the carpets. 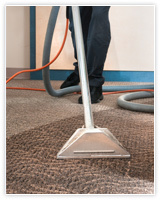 This water shakes dirt, debris, pollen, dust and other particles free from the carpet fibers. Then, the water and the debris is vacuumed away. Among the above options, carpet steam cleaning is the only method that is entirely eco- and family-friendly and the preferred one by Los Angeles Carpet Cleaners customers. You can opt to use a detergent during the steam cleaning process, or you can opt to ONLY use hot water. 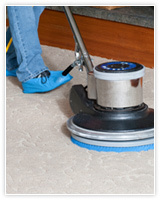 Either is an extremely effective option for removing dirt and debris from your carpets and area rugs. Carpet steam cleaning, in fact, is the preferred method of cleaning carpets by Shaw Industries, the country's largest carpet manufacturer. This is because, in addition to being the 'green' cleaning solution for people and the environment, steam cleaning has zero negative side effects on your carpets. No detergents or chemicals can break down the fibers of your carpets. Routine professional carpet cleaning is an important aspect in maintaining and preserving the health and lifespan of your wall to wall carpeting and area rugs. Los Angeles Carpet Cleaners guarantees you will be more than pleased with our cleaning services for either your home or office location. Our cleaning technicians are thoroughly trained and experienced; they know exactly how to treat all different types of stains, and they know how to clean and protect the various types of carpeting and area rugs, ranging from oriental rugs to office-grade wall to wall carpeting. In addition, we can clean and protect your upholstered furniture and drapery with a similar process. When you decide to enlist professional carpet cleaners, ensure you will be getting the best service for the dollar by calling Los Angeles Carpet Cleaners. We have been serving and pleasing customers in your area, and we would love the chance to discuss our process more with you. Los Angeles CA, Beverly Hills, Santa Ana, Long Beach, Huntington Beach, Newport Beach, Santa Monica, Anaheim, San Bernardino, San Fernando.